Over the weekend I went on a gluten-free cooking spree and one of the things I made was this great gluten-free spicy white chicken chili recipe. I made this in the slow cooker because I think everything tastes better in the slow cooker, but you can make it on the stovetop as well. 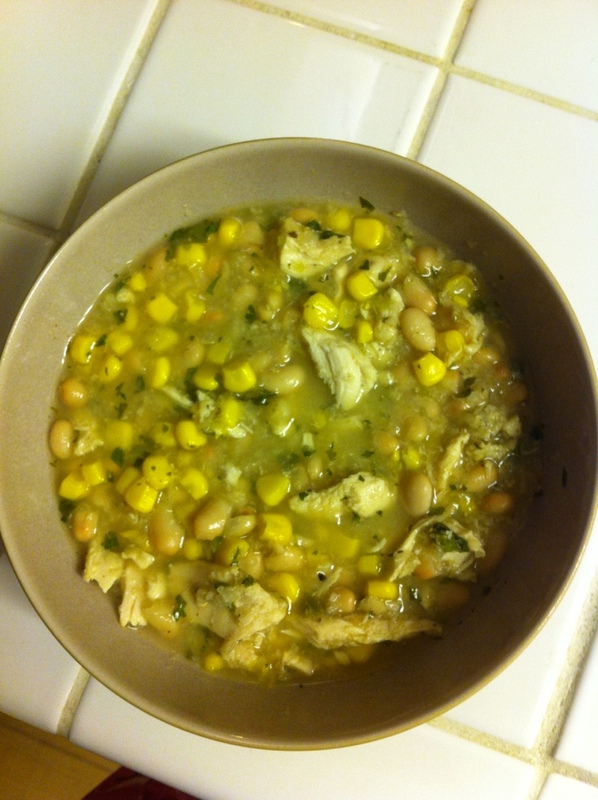 Here is the recipe for this delicious spicy white chicken chili. 1 lb boneless skinless chicken breast. I like to get organic chicken but up to you. The two pieces of cooking items I used for this recipe are the Crockpot (Slow Cooker) and a mini food processor. Both of these items are staples in our kitchen and I highly recommend investing in them if you don’t have them already. We got our crockpot for only $25. First I cut up the chicken into pieces. Then I cut up the onion into big chunks and put it in the food processor. I put the garlic in the food processor with the onion and chopped it all up. So easy. Pour the chicken broth, chicken, onion, and garlic into the slow cooker. Mix it together well and set the slow cooker on low. Cook on low setting for 4-5 hours. Once the chicken mixture is done cooking, take it out and cut it finely so it becomes shredded like. You can also cut it into chunks – whatever you like. Put the chicken back into the crockpot. Note: This step is only necessary if you want to change size of the pieces of chicken in the chili. The finished product. OMG was this good. Rinse and drain the white northern beans and corn. Place in slow cooker. Next, mix the cilantro and jalapeno in the food processor. Make sure to take the seeds out of the jalapeno before placing in the food cooker. Mix the cilantro / jalapeno mixture in the slow cooker. Next, add the oregano, salt, pepper, and lime juice. I use a nifty press to get all the juice out of limes and lemons, but squeezing them works just fine. Next, add the Sriacha and Cayenne Pepper to your liking. I used about 2 squirts of Sriacha and a couple sprinkles of Cayenne Pepper. Remember, there already is one jalapeno in the chili so it will be spicy. I always try and err on the lesser side of spicy so I can add more to my liking once I serve myself a bowl of the chili. I like my food very spicy so it’s a good way to keep people with all levels of spicy preferences happy. Once you’ve done the second round of ingredients in there, mix them all together and place the slow cooker on high for another 30 minutes to 1 hour. Keep an eye on it during this time and keep checking it until it becomes the right temperature for you. For us it was around 45 minutes. And there you have it, my Spicy White Chicken Chili Recipe. Gluten-free, spicy, and delicious. Enjoy! If you make this dish, let me know and post a pic of your meal in the comments! Jim- Glad you and your wife like the recipe! How did you inject your crockpot with steroids? We need to do that to ours. It is slow..and small. Did you see the chicken coconut curry recipe I linked to? I think it was on the day 3 or day 4 recap. It is my favorite recipe so far! Seriously, I don’t know what it is about our crock pot, but we have to cut down the times on all recipes. I didn’t see the coconut curry, but I’ll be sure to check it out. Sounds like you like spicy like we do. Oh yeah, We love our food spicy! I will let you know when I post my meatloaf recipe that I made in the crockpot!